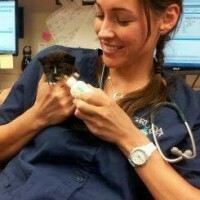 Dr. Jones graduated from Colorado State University’s College of Veterinary Medicine following her Master’s degree in microbiology from Eastern New Mexico University in Portales, New Mexico. Her professional interests include preventative health care, abdominal and cardiac ultrasound and internal medicine. As a native New Mexican, she is thrilled to be back in the Land of Enchantment practicing veterinary medicine. Dr. Jones’ interest in veterinary medicine began at a young age when she spent many summers with her grandparents on their cattle ranch near the Laguna Pueblo reservation, outside of Portales, New Mexico. Other experiences such as working on a dairy farm and for a small animal veterinarian during college solidified her desire to become a veterinarian. Dr. Jones enjoys the challenge of veterinary medicine and is honored to have the opportunity to care for every patient and client. Doctor Jones loves living in Santa Fe with her husband Johnny, two dogs (Spaniel ‘Maggie’ and Lab Mix ‘Quincy’) two rescue guinea pigs (Peanut Butter & Jelly) and even has a baby on the way! When she’s not working she enjoys being outdoors exploring Santa Fe & Traveling.